Home / What is LASIK? Laser Vision Correction involves the use of the excimer laser to reduce nearsightedness, farsightedness, and astigmatism. The excimer laser is a medical device that uses ultraviolet light energy to reshape the surface of the cornea. The cool beam of the laser has the ability to remove microscopic amounts of tissue, one microscopic layer at a time. This allows the excimer laser to, precisely, reshape the cornea so that visible light entering the eye is focused property. Using the Allegretto Wave® Eye-Q Laser , our surgeons have the advantage of 3-D Active Eye Tracking, Variable Spot Scanning Technology adding a blend zone that increases the ablation zone (lasered area) by 51% thus accommodating more pupil sizes, and Variable Spot Beam Technology which allows personalized refractive treatments and adjusts the laser beam size to the desired treatment minimizing corneal tissue removal. With the approval of WaveFront technology, the WaveLight®Allegretto Wave® Eye-Q Laser Treatment is creating an unsurpassed quality of natural vision. Click here to visit the WaveLight®Allegretto Wave® Eye-Q Laser site. to moderate amounts of farsightedness and astigmatism. 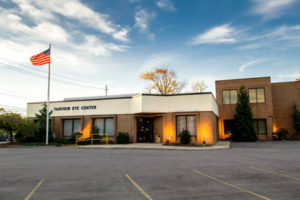 This laser procedure does not use the laser directly on the corneal surface but on the interior of the cornea. A microkeratome (surgical instrument) first creates a disc or flap of corneal tissue, dividing the cornea into a top and bottom section. The top section is then folded back in such a way that the Excimer laser treats the underlying bed of the cornea. Once the laser treatment is completed the flap is then returned to its original position on the front surface of the eye. There is no contact lens with the LASIK procedure, allowing for faster and more comfortable visual recovery. A Laser is used to create a flap of corneal tissue, exposing the interior of the cornea and leaving the corneal surface intact. This allows for rapid visual recovery and decreases postoperative discomfort.The flap is then folded back in such a way that the Excimer laser can treat the underlying bed of the cornea. Nearsightedness, farsightedness, and astigmatism can then be treated by the Excimer laser. Once the laser treatment has been completed, the flap is then returned to its original position on the surface of the cornea. A contact lens is not necessary after LASIK. This allows for rapid, comfortable visual recovery.